24k Yellow Gold Lady Liberty Coin 12mm Genuine Diamond Bracelet 2 1/2 Ct 8.5"
This 24K Gold Layered Cuban Link Bracelet is 7 mm wide and 9" long (can be customized to any size, please contact for details).The bracelet looks absolutely like solid gold one because it has several layers of pure 24K Gold over a heart of semiprecious metal so your friends and family will never be able to tell the difference. The only difference is the cost! FREE LIFETIME GUARANTEE Each piece of jewelry in our store comes with a free lifetime replacement guarantee. It covers absolutely everything except for loss. If your chain ever fades, breaks or simply loses its shine please send it back to our manufacturers (along with the guarantee slip that you will receive with your order) to get a brand new replacement for unlimited times. 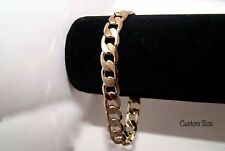 This 24K Gold Layered Cuban Link Bracelet is 10mmm wide and 9" long (can be customized to any size, please contact for details).The bracelet looks absolutely like solid gold one because it has several layers of pure 24K Gold over a heart of semiprecious metal so your friends and family will never be able to tell the difference. The only difference is the cost! FREE LIFETIME GUARANTEE Each piece of jewelry in our store comes with a free lifetime replacement guarantee. It covers absolutely everything except for loss. If your chain ever fades, breaks or simply loses its shine please send it back to our manufacturers (along with the guarantee slip that you will receive with your order) to get a brand new replacement for unlimited times. This 24K Gold Layered Italian Figaro Bracelet is 10 mm wide and 9" long (can be customized to any size, please contact for details).The bracelet looks absolutely like solid gold one because it has several layers of pure 24K Gold over a heart of semiprecious metal so your friends and family will never be able to tell the difference. The only difference is the cost! FREE LIFETIME GUARANTEE Each piece of jewelry in our store comes with a free lifetime replacement guarantee. It covers absolutely everything except for loss. If your chain ever fades, breaks or simply loses its shine please send it back to our manufacturers (along with the guarantee slip that you will receive with your order) to get a brand new replacement for unlimited times. 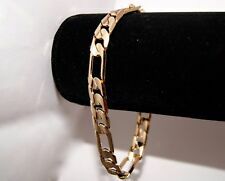 NEW 24K GOLD gp Twisted Herringbone BRACELET 5mm 9"
Beautiful Styling Twisted Herringbone Bracelet! Marked 24k gold Plated. LAGRE 5MM LINKS. Made with a sturdy lobster claw clasp for a secur fit. 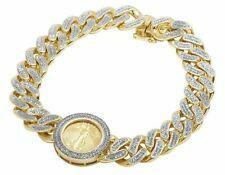 Treat the man you love to the sparkling look of this liberty coin bracelet. Briliantly styled, this bracelet features a24K yellow gold Lady Liberty 1/10 ounce gold coin in the center connected with10K Yellow Gold cuban links. 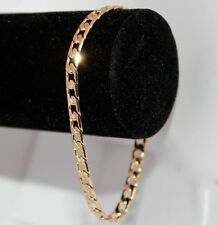 This 24K Gold Layered Italian Figaro Bracelet is 7 mm wide and 9" long (can be customized to any size, please contact for details).The bracelet looks absolutely like solid gold one because it has several layers of pure 24K Gold over a heart of semiprecious metal so your friends and family will never be able to tell the difference. The only difference is the cost! FREE LIFETIME GUARANTEE Each piece of jewelry in our store comes with a free lifetime replacement guarantee. It covers absolutely everything except for loss. If your chain ever fades, breaks or simply loses its shine please send it back to our manufacturers (along with the guarantee slip that you will receive with your order) to get a brand new replacement for unlimited times. 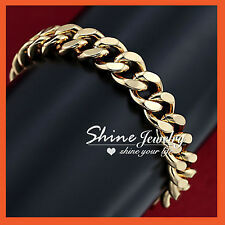 Material:High Quality 24K Gold Plated. wideth about 12mm. Quantity:one piece bracelet gift box. DO NOT DUPLICATE OR COPY! Black Onyx is a soothing stone said to help alleviate fears and worries and help you to feel comfortable within yourself and in your surroundings. It is also believed to promote stamina and vigor and to encourage the making of wise decisions. THE CLASP IS AN "S" STYLE HOOKED AND IS STAMPED "24K" AND "9999". 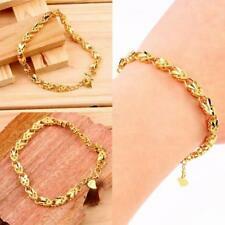 24KYELLOW GOLD SOLID LINK BRACELET. THE WEIGHT OF THE BRACELET IS. It is very-very secure. YOU REALLY HAVE TO SEE IT TO BELIEVE JUST HOW GREAT THIS BRACELET REALLY LOOKS. 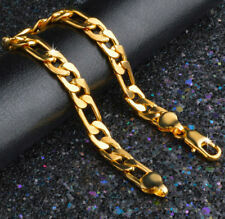 Bead Size: 24k Yellow Gold Closure Beads 5.84mm. Bead Size: Tiger's Eye 8mm. Item Type: Two-Row Spiritual Beaded Bracelet. Color: Brown Tiger's Eye, Yellow Gold, Black Cord. The bracelet looks amazing with any outfit, you can combine different bracelets. 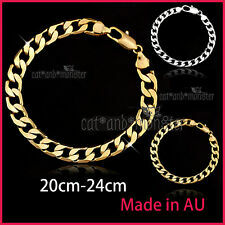 Good Class, Competitive Products, High Quality, Fashionable Style Item Material: Top Quality 24K Gold Plated. Quantity: one piece bracelet. Perfect Gift For All Occasions ! 1 Bracelet, 1 Authenticity Certificate. Know Your Bangle Size Yellow Gold. Gold Purity. Price May Vary. Gold Color. Gold Weight. Length 20cm, width 9mm weight 43g. 24K gold filled/plated, copper/brass base. We will work with you to ensure that any problem is solved. As the pictures show. 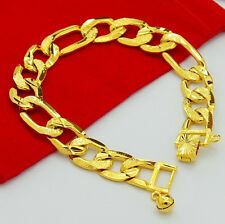 Material:high quality 24K Yellow Gold Plated. Quantity:one piece bracelet. Gold Filled Jewelry Material: 18K Gold Filled with copper. -it is a great low-cost alternative to real gold jewelry. keep them away from wet place & chemicals to maintain them in good condition, and if you have. Style: Curb Chain Bracelet. Material: Gold Filled with copper. 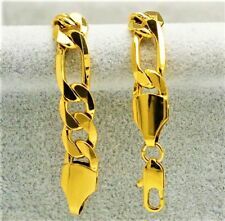 -Gold-filled jewelry is a reasonably priced, quality alternative to solid gold (Ease your mind about losing expensive jewelry but still makes you stand out in occasions like wedding, parties, etc.). Buy once and have it all your life! We only use 18K and 24k gold on our jewelry (THE PUREST form of gold) instead of 10k or 14k! The lobster clasp is very sturdy - FAR SUPERIOR in strength and, also prettier and easier to use. 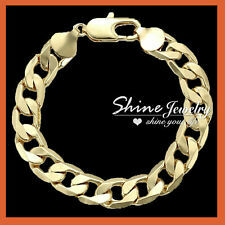 Gold Filled 24kt Diamond Cut Cuban Link Chain Bracelets 11MM with A USA Made! The lobster clasp is very sturdy - FAR SUPERIOR in strength and style, prettier and easier to use. Ends of each Cuban Curb Link chain are soldered for extra strength. We only use 24k gold (THE PUREST form of gold) instead of 10k or 14k!